“Over the past few weeks, Mayor Tory has expressed his concern with Toronto’s ability to support the influx of refugees and asylum seekers that have entered into their shelter system. “Their system is exhausted and they need assistance to deal with the unprecedented amount of claimants and asylum seekers who are arriving in Toronto. “After August 9th, there will be 800 people, many of them children, who will require shelter as the City is no longer able to use two dormitories where they are currently being housed. “Cities are on the front lines of this crisis and we believe we have a moral obligation to act to provide shelter and assistance to those in need so that they can start their lives and contribute positively to our communities. “Mississauga is a member of the Large Urban Mayor’s Caucus and last week, Mayor Tory asked caucus to convene a call to discuss this issue. “Mayor Tory asked that municipalities and regions identify any sites or facilities that could be repurposed as temporary housing, as well as connections to employers for job opportunities. “On this call, we offered our support which includes examining existing capacity within the Region of Peel shelter systems, potential temporary housing sites and facilitating opportunities for seasonal and full time employment. “As we all know, the federal government is solely responsible for immigration and has indicated a willingness to provide funding to fully reimburse municipalities for the complete costs of providing accommodation, services and programs and refugees and asylum claimants. “I was pleased to table a motion at Regional Council that will allow staff to examine existing capacity within our shelter systems, potential temporary housing sites and facilitating opportunities for seasonal and full time employment to support the City of Toronto. 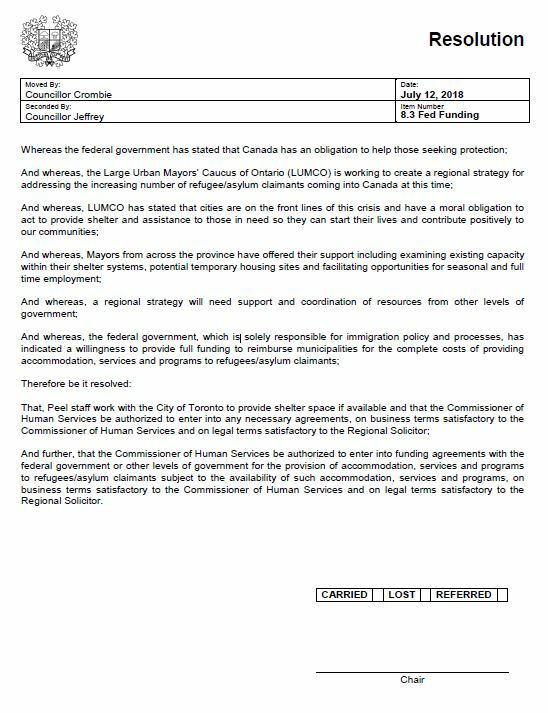 “The motion passed unanimously and will allow Regional staff to start working with City of Toronto staff to provide shelter space, if available, while enabling the Commissioner of Human Services to enter into any necessary agreements, with the federal government or other levels of government for the provision of accommodation, services and programs to refugees/asylum claimants subject to the availability.